A bill that features plans for ‘extremism disruption’ designed to restrict those trying to radicalise youngsters was recently included in The Queen’s speech, and Prime Minister David Cameron included the bill after referring to the UK as a ‘passively tolerant society’. The Ahmadiyya Muslim community has been actively engaged in spreading the peaceful message of Islam for more than 125 years. 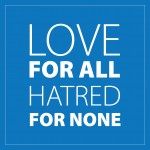 Its Khalifa (Caliph), His Holiness Hazrat Mirza Masroor Ahmad, the London-based worldwide spiritual leader of the Ahmadiyya Muslim community, has repeatedly condemned all forms of extremism. And that message has been sounded out once more by the borough branch of the organisation. Hameed Ahmad, President of the Ahmadiyya Muslim community in Woking, told the News & Mail that radicalisation needs a collective response. He said: “Any genuine attempt to curb extremism is to be welcomed. No true Muslim could contemplate acting against the laws of the land and so if he or she does, then strict law enforcement is needed in such cases. “However, we do not agree that the term ‘Islamic extremism’ should be used in this context; it is in fact misused by the media and by politicians. The Ahmadiyya Muslim community considers terms that seek to link Islam with extremism or terrorism to be entirely wrong. “This falsely associates the peaceful religion with evil acts of extremists and is entirely unhelpful and counter-productive. Radicalisation by ISIL or anyone else needs a collective response. “Families have a role to play in ensuring that their youth remain active citizens, faith leaders have a role to guide people to peace and social harmony, and governments and media need to ensure that moderate voices are given a platform to present the true peaceful message of Islam. “Governments must promote and uphold justice in international affairs.” Ahmadi Muslims, whose work the Prime Minister has described as ‘true faith in action’ have always been engaged from a young age to promote Islam’s values of loyalty, equality, freedom, respect and peace. Just last week, more than 5,000 Ahmadi Muslim youths, including youths from Woking, attended their national convention in Surrey to strengthen their faith in God, to build brotherhood, and to learn about service to mankind and the principle of loyalty to one’s country of residence.